Hednesford Festival is taking place on Saturday 12 August between 12 noon and 6pm in Hednesford Park and Town Centre. The artisan market will be in the town centre from 9am. 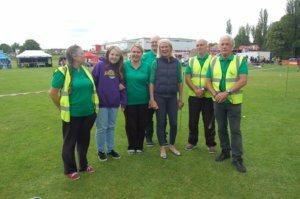 This year, the event is being organised by Hednesford in Partnership who were awarded £10,000 from the Celebrate Big Lottery Fund to help put on a fantastic and memorable event. It is also being supported by Cannock Chase Council, Inspiring healthy lifestyles, Friends of Hednesford Park, Hednesford Town Council and Hednesford Lion`s Club. Hednesford in Partnership carried out a consultation exercise at the beginning of the year to build on the success of last year and to involve the community in shaping this year’s event. As a result of this, there will be a live music stage all day, which will showcase local talent. It will finish with the headlining band – `The Trip`. If you are a keen Parkour enthusiast, get in touch as the event will be a great opportunity to show off your skills using the new equipment in the park. The old fashioned games will be hosted by The Friends of Hednesford Park. Games will include a Target sprint by Rugeley Rifle Club, tug of war, various races and an inflatable assault course. Games will be suitable for teams up to six, so if you think you’re up for a challenge, why not come along and take part or you can sign up on the day. The artisan market will be in the town centre throughout the day. For more information about this event contact Hednesford in Partnership on 07930 120 077 or email lesley@hednesfordinpartnership.co.uk. Follow the Festival Facebook Event for all the latest news!